On June 24, last year, we added another milestone to Penang’s achievements when Bosch Solar announced their decision to invest in a fully integrated crystalline photovoltaic plant at Batu Kawan. Today’s signing ceremony of the sales & purchase agreement with Penang Development Corporation denotes Bosch’s commitment to its investments in a PV plant in Penang. Bosch Solar’s 520 million euro (approximately RM2.2 billion) investment in Penang is expected to generate 2000 new jobs in various aspects of crystalline PV production. The Penang facility is envisaged to grow by 30% in the coming years as the facility will adopt and implement state-of-the-art cell technologies coupled with enhanced production processes. According to news reports yesterday, Najib said that constitutional amendments are required to form an anti-corruption Service Commission with the power to appoint and sack members of the MACC. Currently, MACC officers are appointed via the public services commission. He then added that BN will only carry out the necessary amendments if they win two-thirds in the next GE. 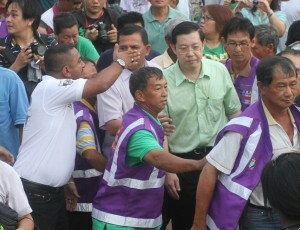 Police Report By Penang Chief Minister Lim Guan Eng In Komtar, George Town On 28.2.2012. Following Violent Threats By Their Members, UMNO and Perkasa Personally Responsible If Anything Happens To Me. Nearly two years ago, the Penang PR state government had set up a Speakers’ Square in Padang Kota Lama to permit not only freedom of speech but also freedom after speech. The Speakers’ Square upholds the spirit of, “I may disagree with what you say but I will defend to the death your right to say it”. The Speakers’ Square is for the public to use to allow them to express themselves freely without threats or fear. For this reason the state government has rarely organised any events in Speakers’ corner. On 26 February 2012, I arrived at 6.30 pm in Padang Kota Lama to attend a Himpunan Hijau 2.0 event organised by a Penang NGO Suaram to object to the Lynas rare earth processing plant in Kuantan. Before my arrival, Penang Senior EXCO member YB Chow Kon Yeow who was there at 6 pm, had informed me by phone of disruption of the peaceful rally by UMNO and Perkasa members. The careless incident in Afghanistan in which copies of the Holy Quran had been inadvertently sent to a garbage burn pit at a US Army camp and subsequently incinerated is an unacceptable act of desecration and dishonour towards the religion of Islam. DAP deeply regrets such an insensitive action that should never have occurred in the first place. Speech By Penang Chief Minister And DAP Secretary-General Lim Guan Eng During The DAP Petaling Jaya Utara Election Fund-raising Dinner On 22.2.2012 Released On 23.2.2012. Penang And Selangor Emerging As The Top Two Manufacturing Investment Location Of Choice In Malaysia For 2011 With RM9.1 Billion And RM8.7 Billion Respectively Proves That PR Can provide Clean And Good Governance That Inspires Confidence From Investors. Penang and Selangor emerging as the top two manufacturing investment location of choice in Malaysia for 2011 with RM 9.1 billion and RM 8.7 billion respectively proves that PR can provide clean and good governance that inspires confidence from investors. This is the second time that Penang has come out as No. 1 in manufacturing investment as in 2010 Penang emerged as top for the first time in history drawing RM12.2 billion in investments. Chua Soi Lek’s Refusal To Release His Own Debate Transcript In Bahasa Malaysia And English Will Only Expose Himself To Non-Chinese Speaking Malaysians That He Focused On Making Personal Attacks,Lies And Adopted Divisive Tactics During The Historic Mandarin Debate On “Is The 2-party system becoming a 2-race system”? Chua Soi Lek’s refusal to release his own debate transcript in Bahasa Malaysia and English will only prove to non-Chinese speaking Malaysians that he focused on making personal attacks, lies and adopted divisive tactics during the historic Mandarin. Not only did Chua made personal attacks against me during the historic debate on 18.2.2012, even his predecessor Datuk Seri Ong Tee Keat was also not spared. Hari ini, saya telah mengumumkan teks ucapan dan transkrip perbahasan saya dengan Chua yang bertajuk, “Adakah Sistem 2 Parti Akan Menjadi Sistem Dua kaum?”. Ini adalah untuk menjawab usaha media massa yang dikuasai BN, yang putar belit ucapan saya dengan fitnah. Pada 21 Februari 2012 suratkhabar milikan MCA, The Star telah meminta maaf kerana fitnah dalam artikel Baradan Kuppusamy di bawah tajuk “All hype but no climax?” yang cuba mengindahkan Chua. Datin Paduka Seri Rosmah Mansor’s Attendance at a Perkasa Fund-Raising Event on Saturday Night Demonstrates UMNO’s and the Prime Minister’s Political Commitment and Personal Obligation to Perkasa(en/cn). It should now be crystal clear to the Malaysian people that the Prime Minister, Dato’ Seri Najib Tun Razak, as well as his Barisan Nasional Government, are open backers of the ultra-nationalist and racist movement, which masquerades as a non-governmental organisation (NGO) in order to disguise its Government backing. Last month, the Prime Minister told the country that the Barisan Nasional had nothing to do with Perkasa’s distribution of “white packets”, traditionally used for Chinese funerals, on Chinese New Year. But at Saturday’s event, the Perkasa leader, Datuk Ibrahim Ali, again reiterated that Perkasa would always support Najib and his administration’s policies, and even said that he was “in awe of Rosmah’s leadership”. Press Conference Statement By Penang Chief Minister Lim Guan Eng In Komtar, George Town On 20.2.2012. Whilst I Had Stuck To The Debate Topic And Avoided Making Personal Attacks, BN-Controlled Media Is Trying To Whitewash Datuk Seri Chua Soi Lek’s Personal Attacks Not Only Against Me But Also Against Datuk Seri Ong Tee Keat. Whilst I had stuck to the debate topic of “Is The 2-Party System Becoming A 2-Race System” on 18 February 2012 and avoided making any personal attacks against MCA President Datuk Seri Chua Soi Lek, BN-controlled media is desperately trying to whitewash Chua’s personal attacks not only against me but also against his predecessor Datuk Seri Ong Tee Keat. The BN-controlled media did not point out that the only personal attacks were coming from Chua. C.P. Scott’s famous dictum of “Comment is free, but facts are sacred’ bears reminder in The Star’s coverage of the Mandarin debate yesterday between MCA President Datuk Seri Dr Chua and myself. The provision of public health care in Malaysia need not be completely overhauled but merely revamped to improve it towards excellence. The DAP believes ensuring the proper allocation of funds without any leakages or hanky panky can not only ensure the public’s right to provision of a standard health care but also improve public health delivery. The DAP calls for the Prime Minister Datuk Seri Najib Minister to intervene and scrap 1Care for 1Malaysia proposal following the failure of of Health Minister Datuk Seri Liow Tiong Lai, to fully examine the adverse consequences of this compulsory Health Insurance scheme. In replacement, the Ministry of Health should conduct a thorough public consultation process involving key stakeholders to ensure that the provision of basic healthcare as a public good and human right is protected and not auctioned off so that well connected individuals and companies can profit from the people. Facts Are Facts Which Can Not Be Changed By Lies:-Would UMNO Leaders Datuk Zainal Abidin Osman And Datuk Abdul Rahman Datuk Dahlan Accept My Challenge That They Retire From Politics If They Fail To Prove That The Bayan Mutiara Land Sale Was Not Done By Open Tender? UMNO leaders have systematically carried out a vicious campaign of lies against the Penang state government on the sale of Bayan Mutiara land in 2010 by open competitive tender at RM 240 per square feet or total sale price of RM1.07 billion. Amongst the lies raised by UMNO Penang Chairman Datuk Zainal Abidin Osman and Kota Belud MP Datuk Abdul Rahman Datuk Dahlan was that there was no open tender; the selling price was sold to a private developer at 50% lower than the market value of RM 420 per square feet; and that the Penang state government had insulted local Malaysians by appointing HDB Singapore as a consultant for the state government’s massive affordable housing project in Batu Kawan. It was reported yesterday that former Petronas CEO Tan Sri Hassan Marican is set to be appointed chairman of Singapore Power Limited (SP) in June succeeding Ng Kee Choe who is retiring. Tan Sri Hassan left our national oil company in 2010 allegedly due to friction with the current administration, and has since been appointed as director in a number of foreign firms such as Singapore government-linked companies SembCorp Industries Ltd, SembCorp Marine Ltd and Singapore Power. He is also a director at Sarawak Energy Bhd and US oil and gas giant Conoco Philips. It would appear that Tan Sri Hassan is internationally appreciated and highly sought after by big multinational corporations but not at home. This is extremely sad,especially when Tan Sri Hassan is widely credited as the man who turned Petronas into the leading international oil and gas company that it is today.